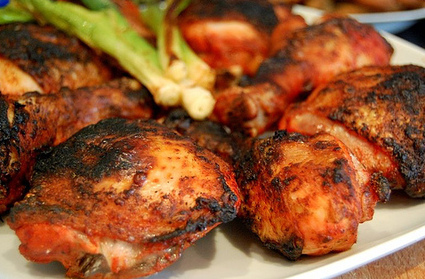 This tandoori chicken recipe is another classic spicy Indian recipe but here the heat has been toned down a bit for our western taste buds. Of course just add more chilli to turn that temperature back up again. For best results use a clay tandoori oven but as most people are unlikely to have one of these tucked away in their cuboards, a simple bbq is fine. And if it's raining, use the grill if you really have to! Stab the chicken drumsticks with a fork. Make sure you cover most of the chicken with little holes. To make the tandoori marinade we need a large bowl (big enough to hold all of the chickenb and more). Put in one cup of water and the yoghurt. Add the red chilli powder, ginger powder, coriander powder, garam masala, garlic powder and cumin powder. Mix well. Add the chicken pieces and cover. Now put it in the fridge and let it sit for as long as possible. I reccommend 6 hours but longer is better. Over night is fine. Ok, now it is time to cook. It is better to do this on a barbaque but under the grill is fine. Before you begin to grill, cover the chicken in meltedd butter. Turn often untill the chicken is cooked through.